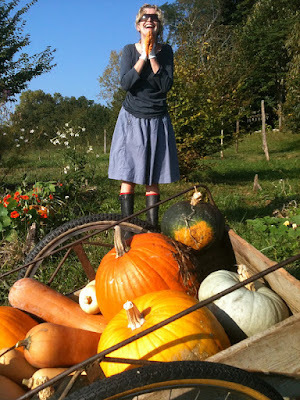 The winter squash are already harvested and resting in the sechoir (my laze spot at the back of the barn). After growing vigorously over the summer, trailing their long-stemmed running vines and huge broad leaves and flowers of both sexes, they are now ready to hibernate inside for the winter. All those exotic shapes, colours and sizes to try out over the coming months. 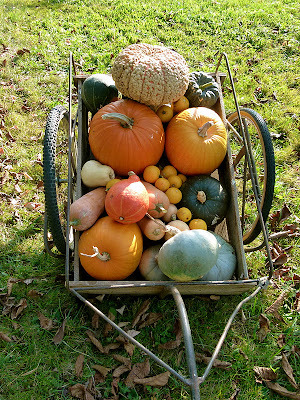 In the summer we consumed the Baby Boos, Delicata, Golden Apple, Yugoslavian Finger and Thelma Sanders Sweet Potato when small and thin-skinned in a salad raw or to replace a courgette while the hard-skinned Waltham Butternut, the Chirimen, Longue de Nice, the Galeaux d'Eysines, Hungarian Blue, the Hubbard Golden Delicious, Kaboscha ooze sweetness and are kept for cold evening and warm dishes. 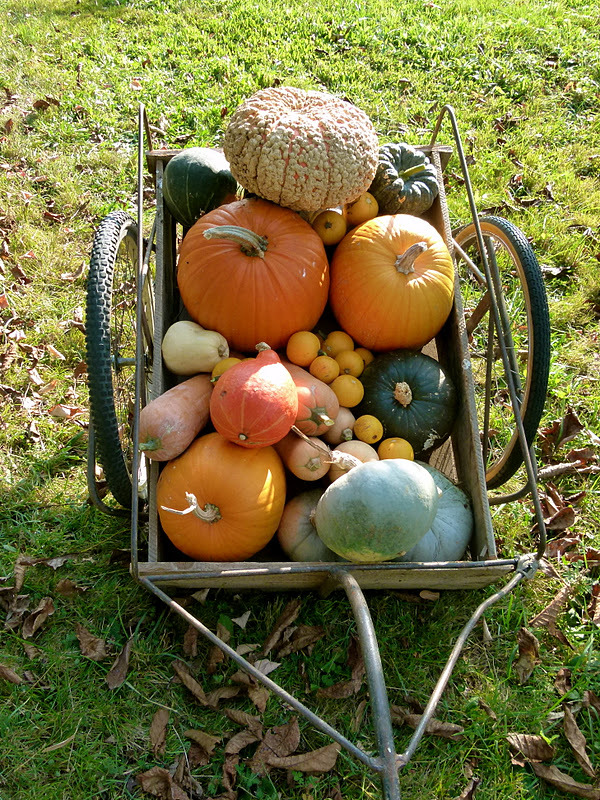 Squash are the greediest plants in the garden and are meant to grow in the compost tip itself rather than in plain fertile soil. I grew them this year where oats and phacelia had loosened and nourished the soil over the winter months and heaps of fresh compost were dug into the earth in early march, mulched with straw and let to sit until the worms had finished their job. The small, greenhouse plants were then sown out in mid-may. From then on they will adore you if you feed them litres of nettle tea and mulch them to keep their bed humid over the hot weeks of fruiting season. The male flowers are more delicate than their cousins, the courgette flowers but if picked fresh can make just as good a frito misto and the tips of the young trailing vines are used as a green vegetable while the seeds are roasted in the over and tossed into all sorts of dishes. The signs that tell you they are ready for harvest and are when the fruit stalks turns dry, woody and fibrous, the fruit sounds hollow to the touch, the skin hardens to rock quality, the seeds inside are well-developed and they are heavy with goodness. Cut from their blackened and withering plants, I leave them sunbathe a few days longer on the garden wall so they will store for longer over the winter and as our winters our mild, I can keep in the sechoir on latted trays to air them, keep them dry and stop the rot. Last year I had enough squash to get me through to March and this year I might just beat the record although by that time I'll be dying for broad beans and peas and loathing the look the last dried out and coarse, old butternut. Stuffed with vitamins of all types and minerals galore, its good to remember that the oranger the flesh, the healthier they are and the better they taste. My favourite has to be the Hungarian blue whose flesh is the firmest and deepest of oranges. Once I manage to skin the fruit they are pureed and served with duck confit, spicy sausages or roasted guinea fowl, curried with chickpeas and coconut milk or just simply sliced, seasoned well with pepper, rosemary, thyme or spices like fennel, chilli and jamaican allspice to concentrate the flavour before using them in soups, salads, ravioli and risotto. Preheat the oven to 200°/4. Slice the top off each of the squash and scoop out the seeds, guarding the lid. Grind the coriander seeds, oregano and chillies with a pestle and mortar or spice grinder until a fine powder. Chop the tomatoes into thin slices. Oil the inside of the squash and season well. Mix the tomatoes with the spice mixture and add to the squash. Put the lids back on the squash and space them out well on a baking tray lined with parchement paper. Cook in the oven for 1 hour or until the flesh is well cooked and soft. Serve with a simple salad of watercress dressed with a little balsamic and olive oil.